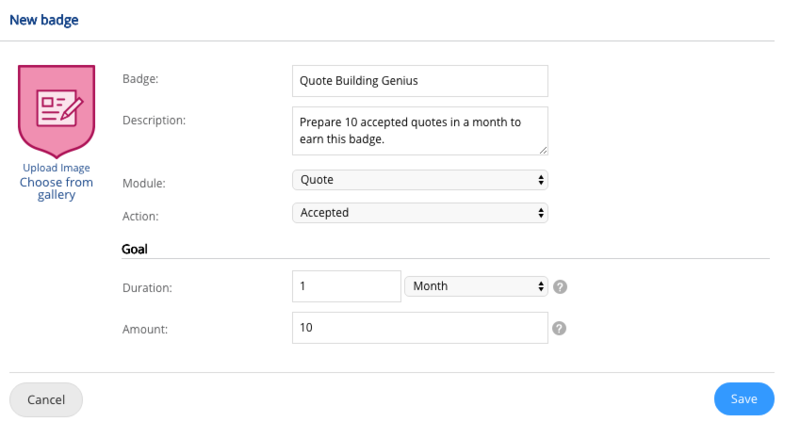 Badges are rewards presented to an individual TeamGram user when certain goals are accomplished in a given time frame. A badge is a permanent reward, it can not be taken back nor deleted once it’s earned. 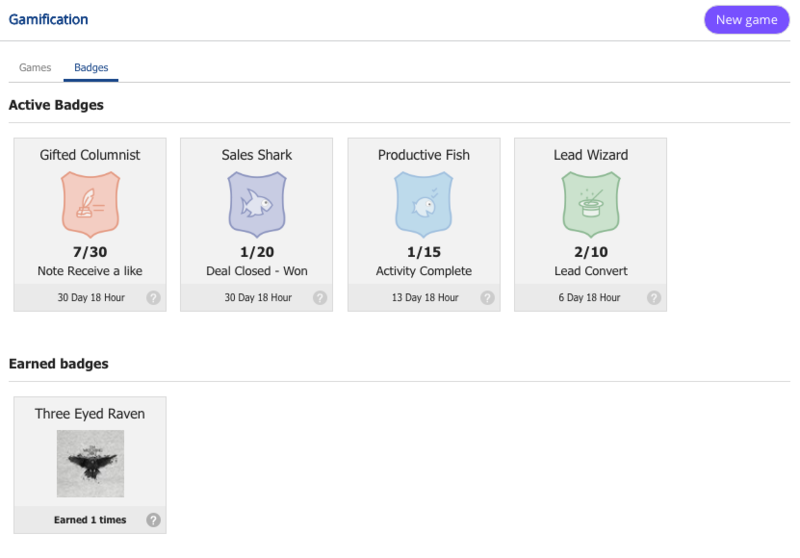 TeamGram Gamification starts with 4 default badges. These 4 badges immediately becomes active when gamification is enabled. You may always deactivate or edit the default badges and create new ones. You have to be a system administrator in TeamGram to create a new badge. Go to ‘Control panel’ from the left menu and click on ‘Gamification’ under the feature settings. Navigate to the ‘Badges’ tab to see a list of badges. Use the appropriate icons to edit, copy or delete the listed badges. Click on the ‘New badge’ button. Upload an image for this badge or choose one from the badge gallery. Description: Enter a detailed description of this badge. Module: Choose the TeamGram module to be accounted for this badge. 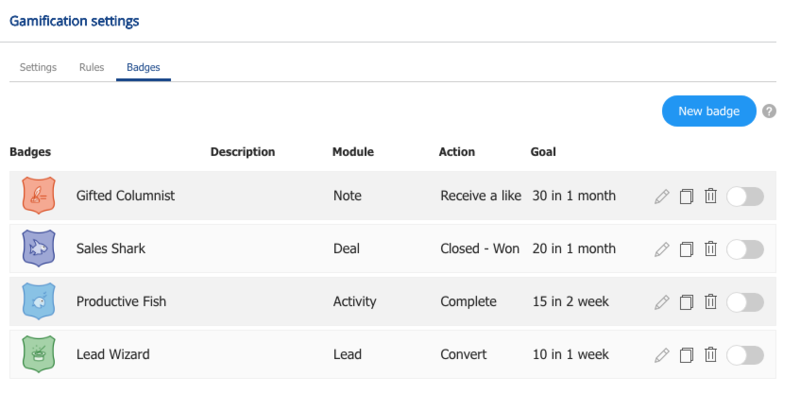 Action: Choose the action associated with the module you selected. Duration: Specify a duration for this badge to be active. The users will have to complete the actions in this duration. Amount: Enter the amount of the actions required to earn this badge in the specified duration. Your new badge will become active once it’s saved and will be listed in the ‘Badges’ tab under gamification settings. Note: You can deactive badges that you don’t want to use for a while using the radio buttons in the Control Panel> Gamification> Badges tab. The actions and the progress of the users saved for this badge will not be deleted when a badge gets deactivated, user progress will continue as it was when it becomes active again. The remaining time will continue to count down even when a badge is deactivated. Deactivated badges are invisible to users and can not be earned. Click on the trophy icon to navigate to gamification page. Navigate to badges tab to see active and earned badges. Your progress and the remaining time to earn the badge are displayed on the active badges. All progress will be lost when the duration ends. The badge will become active again and you will have to start over. You will earn the badge if you accomplish its specified goals in time. Earned badges are displayed below the active badges.